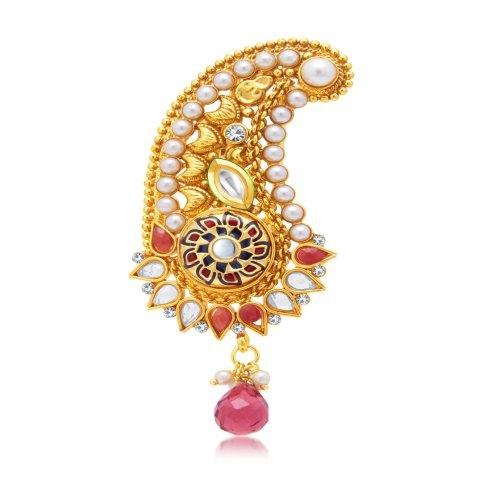 This Sukkhi Youthful Gold Plated Kilangi Brooch For Men is made of Copper. The Kilangi is a Royal Mark of honor completed with a combination of stones and beads with a perfect shade of grandeur. It ideally adorns a man's Sherwani / Safa / Jacket for weddings & engagements to give the Maharaja look. The plating and the embedded stones are carefully chosen and as a result, will not lose their glimmer if maintained properly. Like other ornaments, they need to be maintained but are the perfect embellishment for any man. These days, no traditional marriage ceremony attire is complete without a kilangi. ItYs not an add-on, it has almost become as a prerequisite.